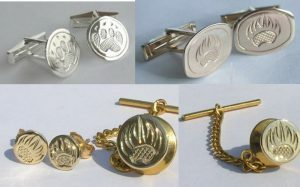 Also tie-tacs, lapel pins, broaches and anything else that doesn’t fit into one of my nice little categories. 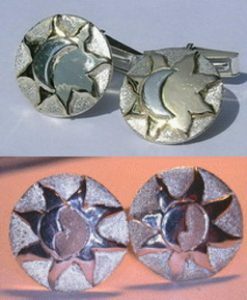 CL1 – Bearclaws on gold CL2 – Wolfpaw and Bear Paw TT2 – Bearclaw Tie-tack. Any amount of different designs are possible, from animal themes to Nature themes or just basic shape and design. The Sun is often recognized as a symbol of rebirth, strength and power. The moon is associated with the female in many cultures often in the form of a goddess. These Sun and moon tattoos would really present well in color. … You can see how the masculine and feminine in this tattoo complement each other. The Moon is a feminine symbol, universally representing the rhythm of time as it embodies the cycle. The phases of the moon symbolize immortality and eternity, enlightenment or the dar k side of Nature herself.